The picture on the left shows the hill that was cut into by the large backhoe parked in the driveway. 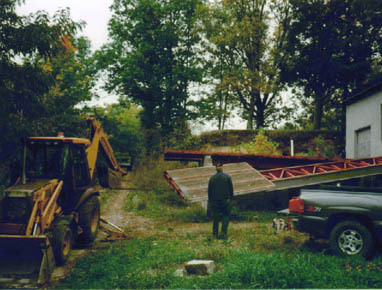 The earth, stones, and skeletal remains were dumped down the slope to the left of the driveway. The picture on the right shows the results of restoration efforts after six years of work. 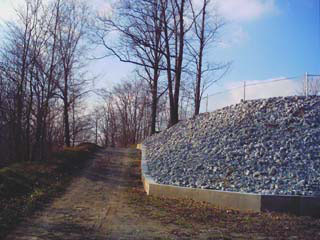 The retaining curb controls "rip-rap" rocks; the rocks prevent erosion. 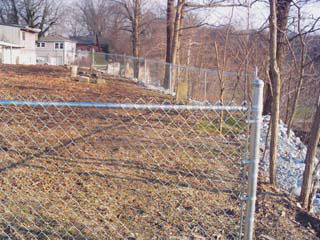 The chain link fence along cemetery border marks the sacred ground and is an attractive addition to the neighborhood. 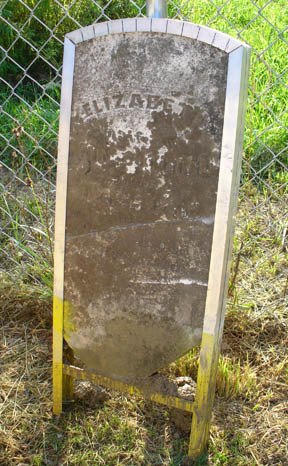 Private owners throughout most of the 20th century had r espect for the Cottrell Cemetery, and it remained in good condition until the 1990s. Then the story of this burial ground took a horrific turn. 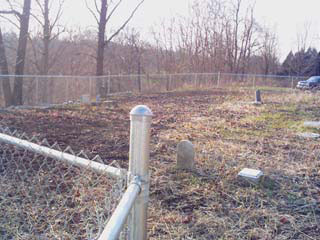 The owner of the property at that time began using the cemetery grounds as a parking lot for cars and heavy equipment. Needless to say, the destruction to the grave markers was enormous, but problems at the Cottrell were only beginning. 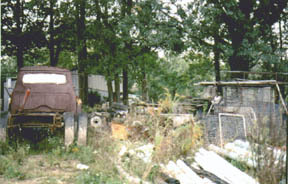 Junk and debris were added to the abandoned machinery, and weeds, undergrowth, and small trees soon covered the area as well. A surrounding line of cedars hid the destruction and misuse from the neighborhood. If the situation was not bad enough, the land owner then decided that he needed a driveway through part of the cemetery. With a complete disregard for the sanctity of those buried there and for their descendents, the owner took his heavy equipment and cut into the burial area, dumping earth, markers, a nd bones over the side of a nearby hill. Rain and erosion then caused unearthed skeletal remains to be washed into neighbors' yards. 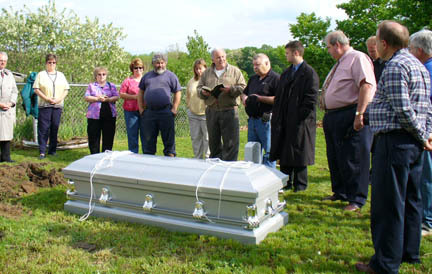 The neighbors alerted authorities, and the situation was brought to the attention of the township trustee, cemetery commission, and county coroner. Further destruction was stopped. However, at that point, the damage was so extensive that the restoration costs were estimated at over $75,000. 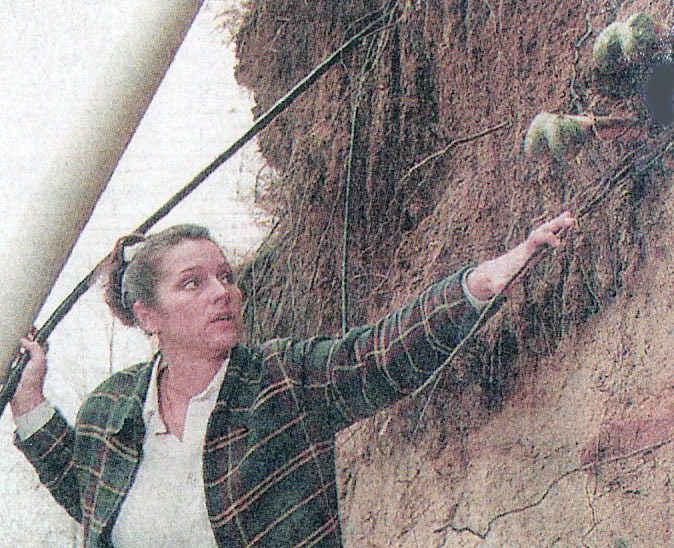 The Indianapolis Star was made aware of the Cottrell's plight, and that newspaper ran two articles, complete with pictures of femurs protruding from the earth, in the January 12th and February 4th, 1998, editions. The Department of Natural Resources also became involved, and that state agency took charge of the exposed remains. 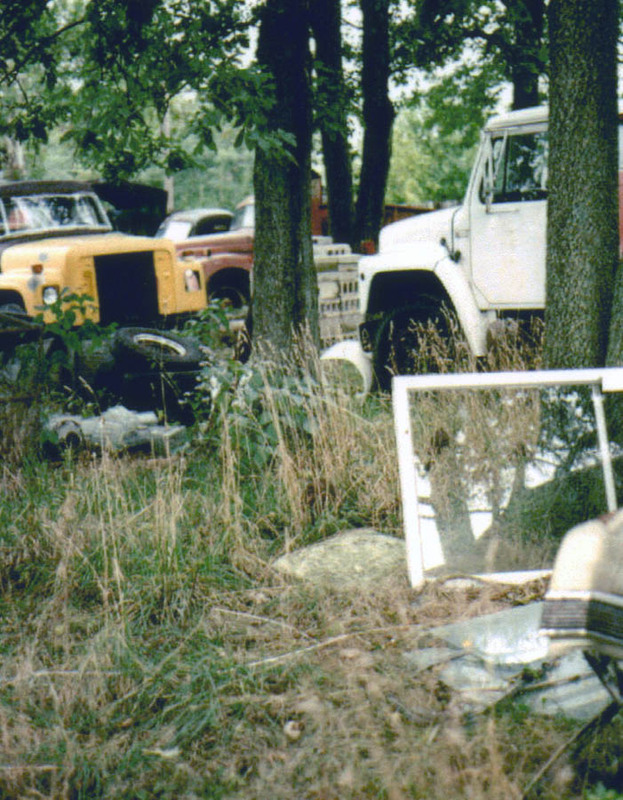 The new owners of the property turned the cemetery over to the township trustee and with that legal hurdle met, restoration of the Cottrell Cemetery was begun in 1999. 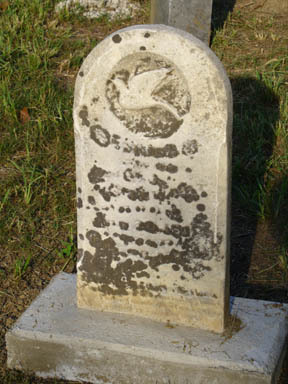 For six years, the Madison County Cemetery Commission has been working with descendents, the township trustee, present owners, neighbors, and the DNR toward complete restoration. 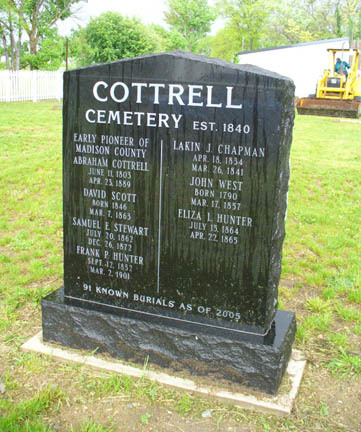 After six years of restoration, the Cottrell Cemetery containing almost ninety individuals has been cleaned of machinery, debris, junk, and undergrowth. The area has been protected from erosion, re-landscaped, and reseeded. The perimeter has also been opened so that neighbors and travelers can view and appreciate this piece of Madison County history. 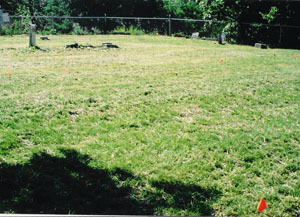 In the spring of 2005, descendents of John and Abraham Cottrell funded the use of GPR (ground penetrating radar) to locate buried remains and thus the original layout of graves and rows. MCCC volunteer Rob Hains then marked the location of each grave with a red flag on a metal stake sunk into the earth. The picture at right shows the landscaping and new grass and is looking back toward the driveway and downward slope of the hill. 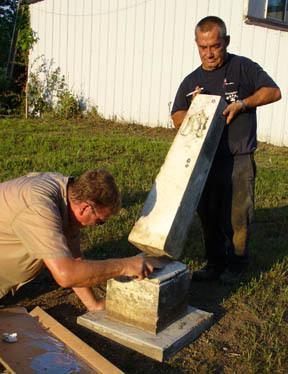 At this point, MCCC volunteers took the opportunity to position in the cemetery the Veterans Administration replacement stones for the soldiers of the 1812 and Civil wars. 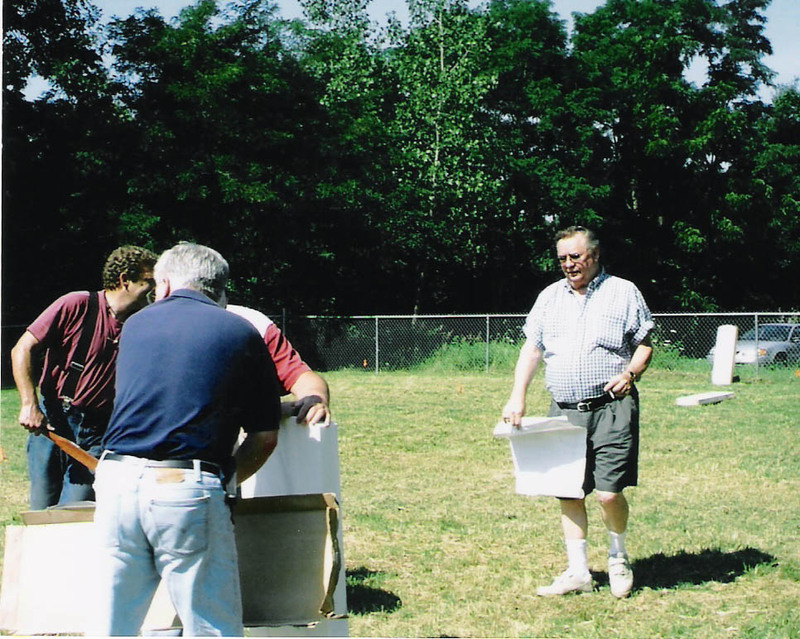 At left, Rob Hains consults the Cottrell Cemetery book which compiles information from historical records, transcriptions, and personal remembrances. At right, MCCC Chairperson Ranny Simmons (dark blue shirt) and Cottrell family members then unloaded the new, crisp, individually boxed veterans' replacement markers. On the left, family patriarch John Cottrell was a soldier in the War of 1812. 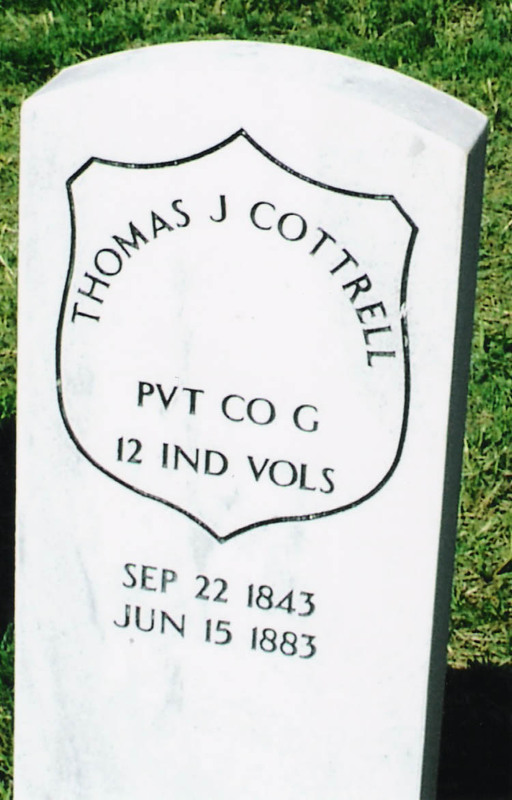 On the right, the stone of Thomas Cottrell shows the shield used to designate a Civil War veteran. 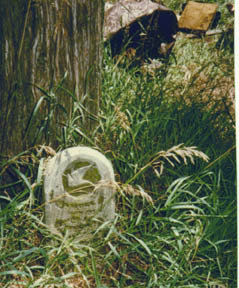 In the middle, the picture of Melville Hunter's stone shows the substantial length of the VA markers. 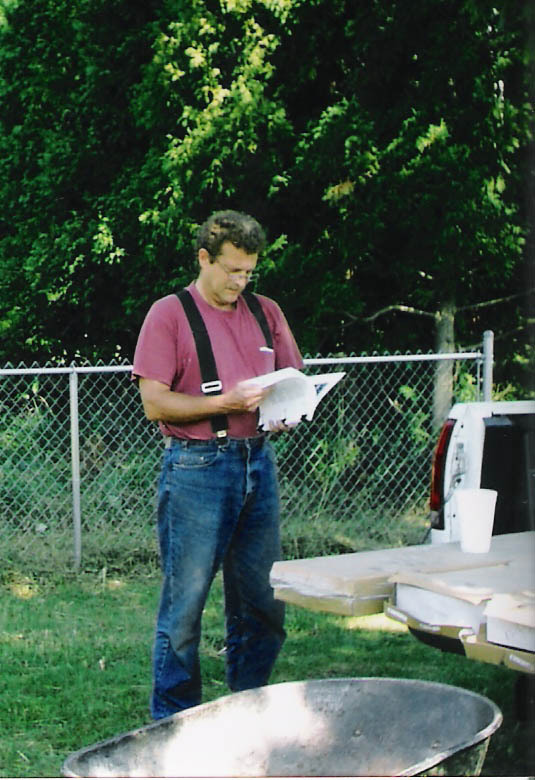 Repairing and resetting stones take dedication and hard work especially when done during a hot, humid Hoosier summer. 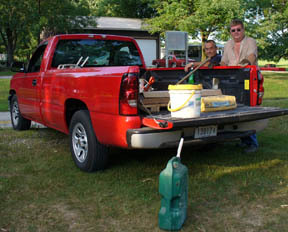 Larry Brown, right, and Herb Justice, left, were the hands-on "get-r-done-guys" for much of the reclamation of the Cottrell Cemetery. Once they were contracted, restoration progress quickened dramatically. 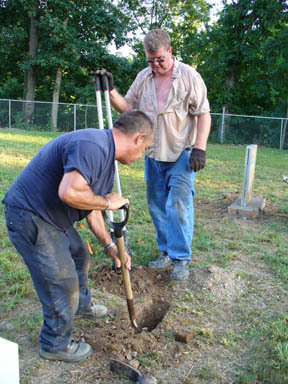 The new fencing and landscaping, the repairing, setting, and adjusting of the cemetery's grave markers were their handy work. Their efficiency, precision, and innovations contributed to the Cottrell Cemetery's surprising transformation. 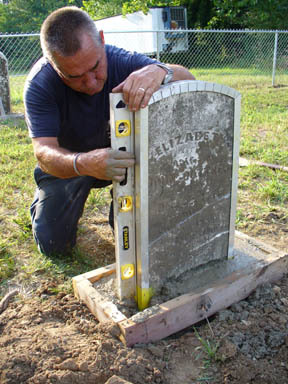 Setting the VA replacement markers is done differently than the resetting of original stones. At left, a rectangular hole, around twenty inches deep, is dug into the ground. 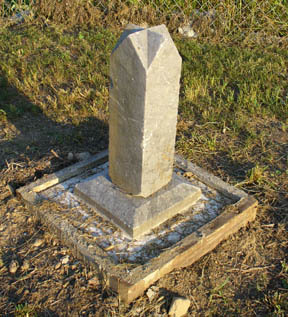 An couple inches of pea gravel are placed in the bottom and the stone, at right, is inserted and aligned. Pea gravel then fills the hole and supports the stone on all sides. A layer of earth is placed over the gravel. 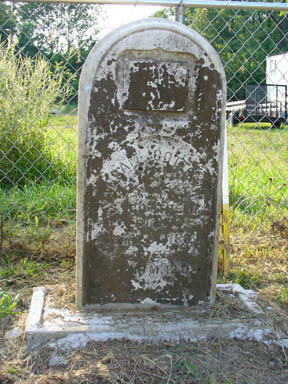 Larry and Herb are shown in the picture above carefully aligning William Cottrell's stone with those of Thomas and Samuel. The VA replacement stone in the background is that for John Cottrell. 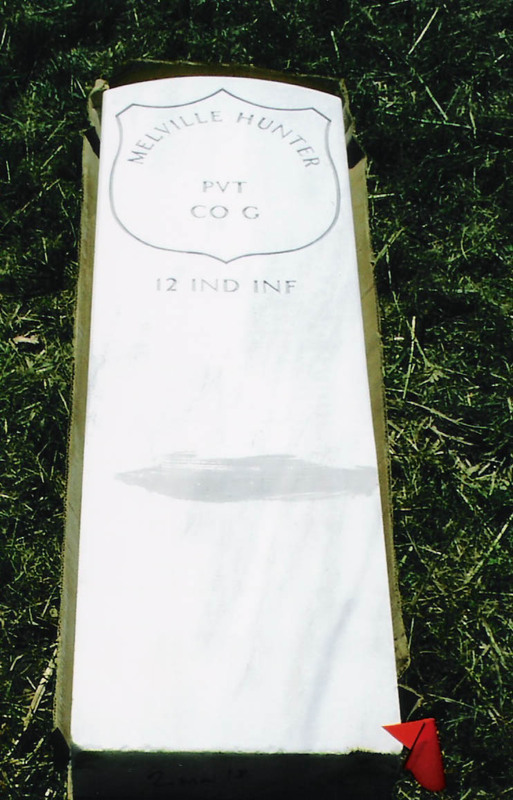 In the case where a veteran has lost part of the original marker, the replacement stone is set beside the original. 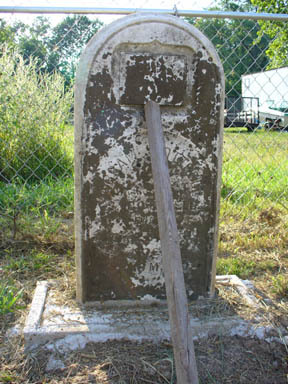 At right, the top part of John Cottrell's original stone, leaning against the fence, will be placed inside the wood frame beside the VA replacement stone. The wood framework forms the cement for the new bases as in the picture below left. The repairing of broken stones actually takes places indoors. The pieces are transported to a place out of the weather. Epoxy is used to fasten the pieces together, and an aluminum frame is used for additional support. 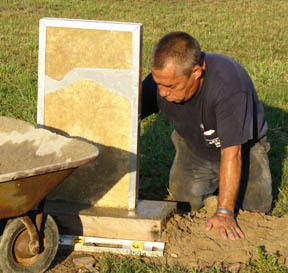 Herb Justice finishes the cement curb for this stone, at right, which shows the epoxy in gray and the surrounding aluminum frame. The aluminum is cut precisely to fit the stone as can be seen by comparing the stone at right and the pictures below, left and middle. Once the wood framework for the new base has been partially filled with cement, care is taken to level stone and align it with others in its row. 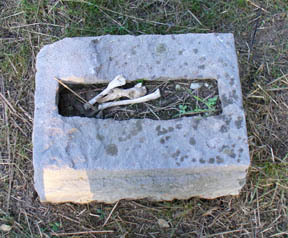 The framework is filled with cement, and while the cement hardens a brace may secure the stone. The yellow on the bottom of the aluminum frame, in the middle picture, is zinc oxide which prevents the aluminum from deteriorating once in the ground. 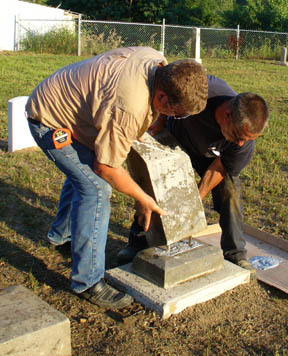 Repositioning and aligning lopsided bases are also parts of cemetery restoration. Securing the parts of unbroken markers follows. Again, epoxy is used to "glue" the parts together. 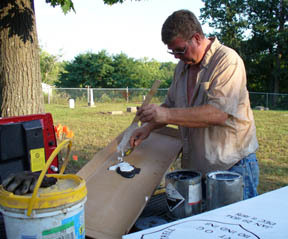 Above left, Larry mixes the components of the epoxy together. In the middle picture, Herb holds the top while Larry spreads epoxy onto the base of Thomas Scott's stone. At right, the new cement can be seen below the base. 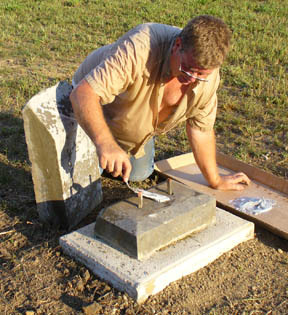 On a stone of later vintage, Larry applies the epoxy to the base, left, and around the metal stakes that help secure the top. At right, Herb and Larry position top onto stakes and foundation. While black liken still mars the fronts of two of the stones above, it is remarkable that any stones survived the destruction rendered upon the Cottrell Cemetery. 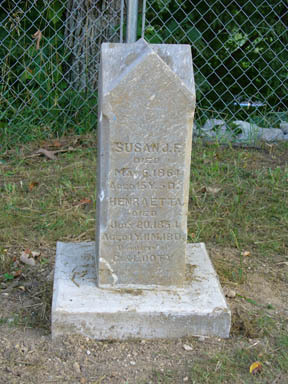 The stone of Abraham Cottrell, 1803-1889, is at left, and the marker for sisters Henrietta and Susan Doty is in the middle. 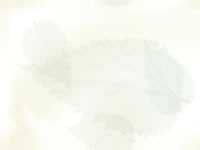 At right, the picture of the new base for the "dove stone" should be compared to the picture toward the top of the page which shows this stone in the undergrowth and leaning against a tree. The last stone to be erected was the memorial tablet containing the names and dates of Cottrell family members buried at this location. 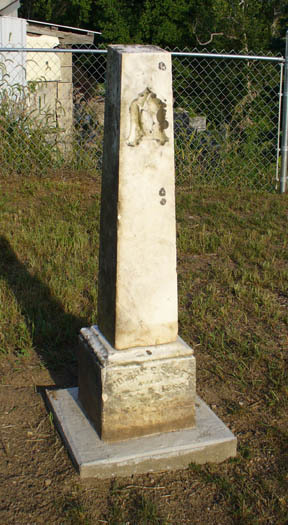 The impressive black marker, at right, was donated by Cottrell descendants. Cottrell descendant Ralph Ridenour installed the beautiful white vinyl fence which faces the road. The large blue sign from the Indiana Department of Natural designating the Cottrell Cemetery as listed on its register of historic places will be positioned to the right of sign above. 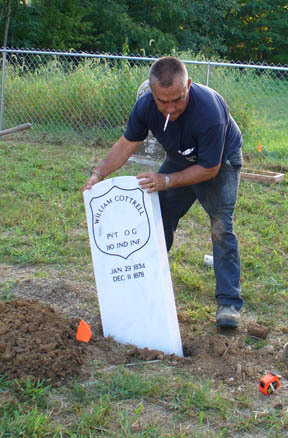 The last task in the restoration process for the Cottrell Cemetery was re-interring the human bones unearthed during the desecration. The bones had been confiscated, studied, and DNA tested by the University of Indianapolis. The scientific results disclosed that the bones were from four individuals: one female over fifty who was a Cottrell relative, a male over forty, and a male and female each in their twenties. A few days before the scheduled rededication ceremonies, the U of I released the bones to Cottrell descendant Richard Kreegar, who is at right in the bottom right photo. Anderson funeral home Brown, Butz and Diedring graciously donated their time to transport the remains from Indianapolis, their help during the re-interment process, and the silver-colored casket used for the reburial. 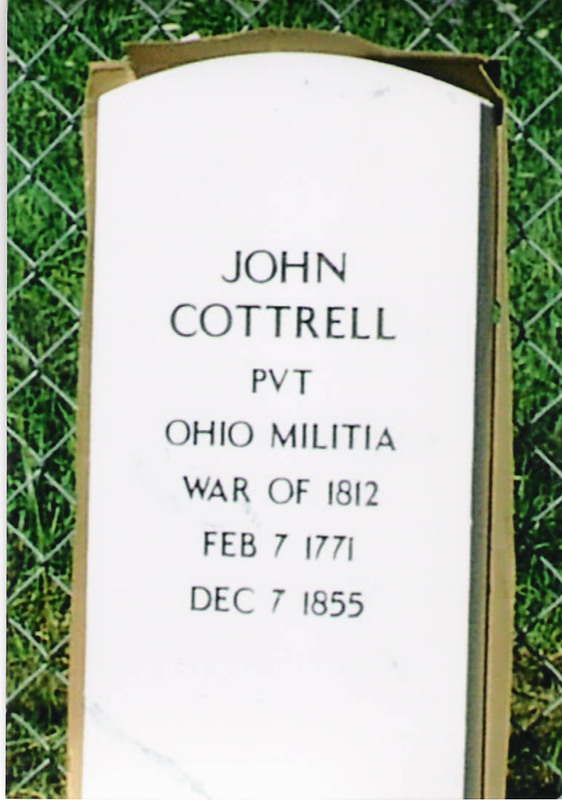 After seven years of dedication and hard work from all invovled, on Sunday, May 21, 2006, rededication ceremonies were held for the Cottrell Cemetery in Green Township, Madison County, Indiana. 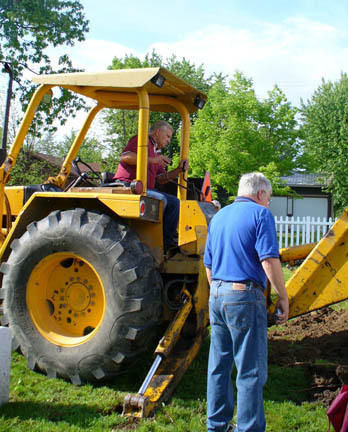 At top left, Green Township Trustee Greg Valentine begins digging the six foot deep grave for the re-interment. At top right MCCC chairperson Ranny Simmons helps Greg with the details. 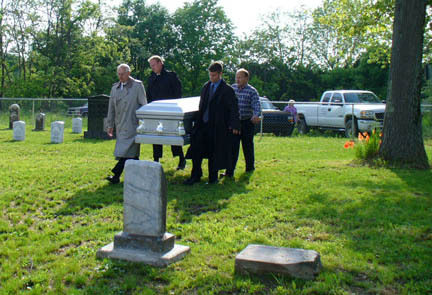 At bottom left, members of the Brown, Butz and Diedring Funeral Home, along with MCCC member Russ Willis in shirt, carry the casket from the hearse to the grave site. At bottom right, Pastor Tim Wilbur from the Pendleton Methodist Church delivers a eulogy and prayer. 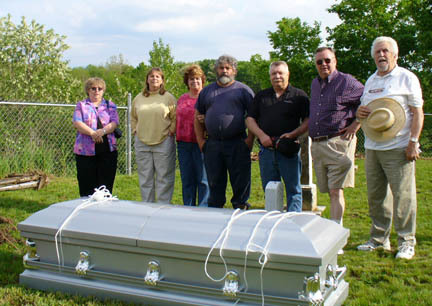 Cottrell family members pose with casket containing the remains of four individuals originally buried in their family cemetery. 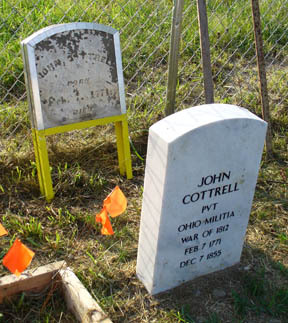 The re-interment of these remains represent the completion of the Cottrell Cemetery restoration project which took seven years. The rededication ceremonies were Sunday, May 21, 2006.